Arrived last night, a little before 3AM, to Alexandria VA for the meeting of Interpol and EPA officials on their plan to enforce against dumping of "e-waste". Our newest WR3A intern, Matt Birnbaum of Middlebury College, is with me, I picked him up in NYC and got to know him on the way down. How will Interpol enforce the difference between export of commodities and export of waste? If Interpol accepts the BAN allegation that 80% is toxic waste, then the 20% seems like a small price to pay. 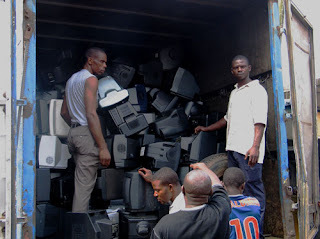 But if the African entrepreneur is spending $7000 for the sea container shipping, $10,000 for the load of computers, and flying to the USA to pre-inspect the load, what is the real likelihood that the 1,000 computer monitors are waste? How will Interpol know? Take a look at BAN's own photo from their website. This is a containerload being emptied in Lagos. The caption states that "many" of these which are not working will be dumped. That's probably true, but then again, that doesn't really support BAN's contention that 75%-80% are waste. What a professional sees is a containerload of very specific sized televisions. It actually would take Good Point Recycling a couple of months to set aside a load of TVs of just this size - 12 to 16 inches. The larger TVs, which are more common, contain more copper, so if BAN's allegation that these will be burned for scrap is true, it's curious that there are no larger TVs visible. Or for that matter, printers, or other electronic scrap. What I happen to know about this size of TV is that they are in demand in places where electric current is so weak that a 19", 25", 27" etc television will not boot up. These are typically in demand in poor but upwardly mobile areas. The slums don't have electricity at all, the rich people have strong enough current to boot a large TV... and in developing countries, the rich tend to have flat screens. But back to the economics. There are about 1000-1500 TVs in this container (I've never done a shipment like this, and have never sent a containerload of TVs to Africa and don't recommend it). If they are costing the African entrepreneur, between shipping and inspection and per unit, about $13 per TV, how many of them could possibly be bad? My company doesn't do this. But sometimes I wonder, is the world better off when good people withdraw from a trade? It would be interesting to do a psychology test and show the photo to Americans and try to find out what is behind our reaction, why it does not occur to people to figure out a legitimate reason for the men pictured to purchase these TVs, why no one at BAN thought of the electric current demands in upwardly mobile shared electricity markets in Africa. If the photo elicits disgust, what is disgusting? Is it fear of capitalism, business, and trade? Or, most ominously, is it a white reaction to black faces? If the load is legitimate, has BAN turned the men above into a Willie Horton campaign?